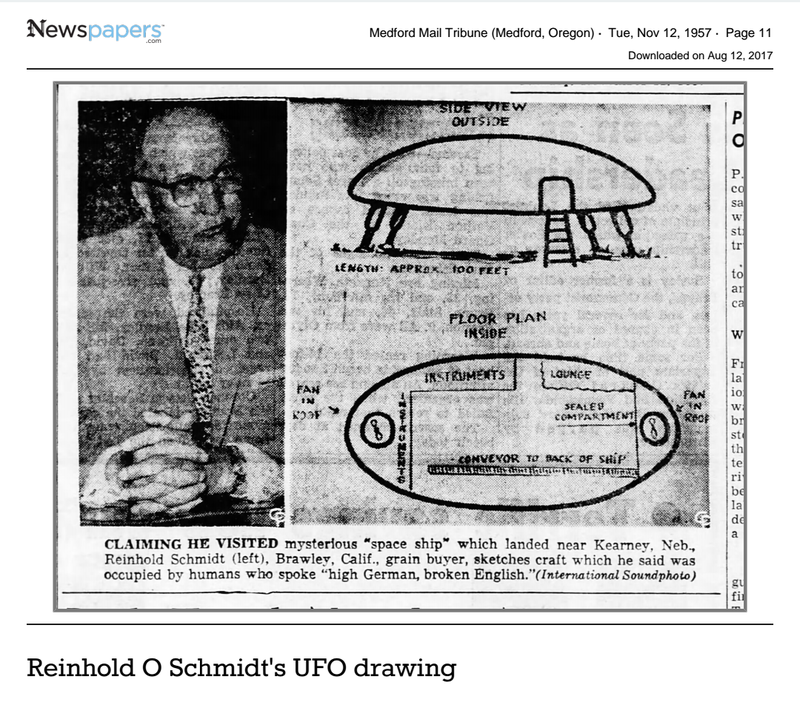 Soon afterward, Reinhold O Schmidt of Bakersfield, California, began claiming that he’d been invited aboard a cigar-shaped space ship near Kearney, Nebraska, by six aliens who spoke German and English. In fact, in the space of a short amount of time, the heavens were apparently filled with weird visitors. The reason was readily evident. 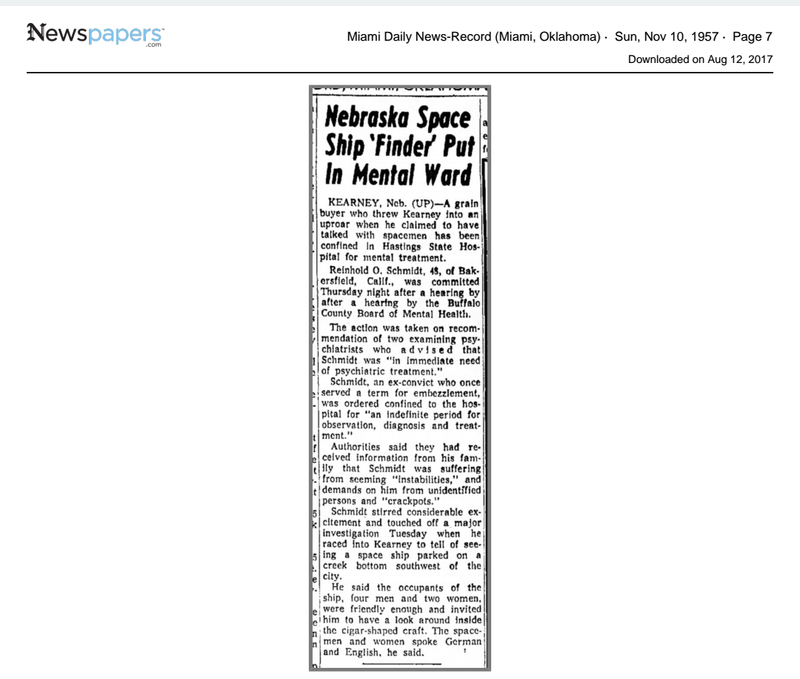 November 3, 1957 had seen launch of Soviet Sputnik 2, the first Earth space vessel to carry a living animal, a dog named Laika who died a few hours after launch. 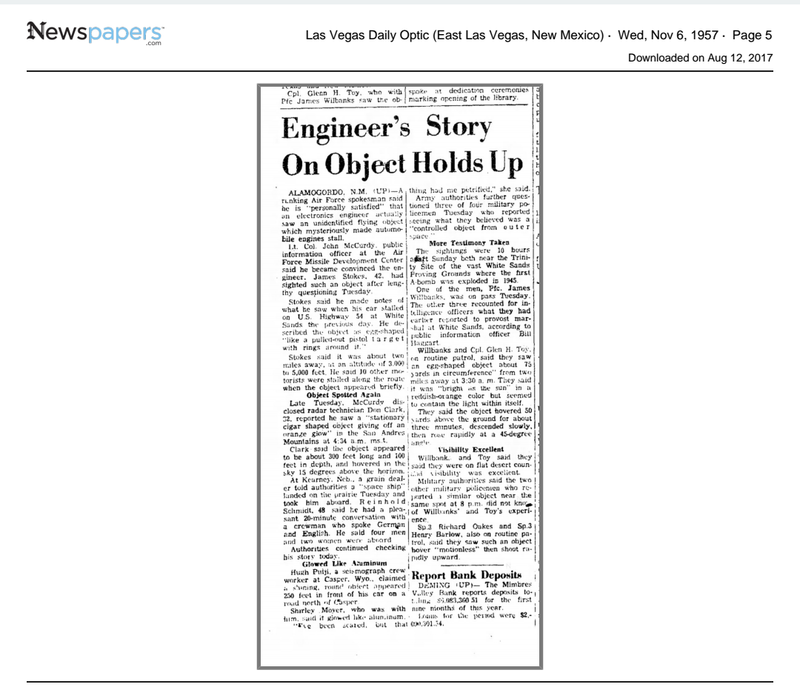 “Many mysterious objects are being seen over towns in many parts of the world. I have just flipped on the radio and the news broadcast says that a spaceship was seen over Johannesburg, South Africa last night. Many people in Houston, Texas watched the oval shaped spaceship play hide-and-seek in and out of the clouds. Many people have just seen it over Beaumont, Texas. The Air Force has investigated and says there is no explanation. The glowing red objects go as fast as light. The world is puzzled! seem like torches, they shall run like the lightings (Nah. 2:3-4). More explicitly, Adventist Elder B.R. 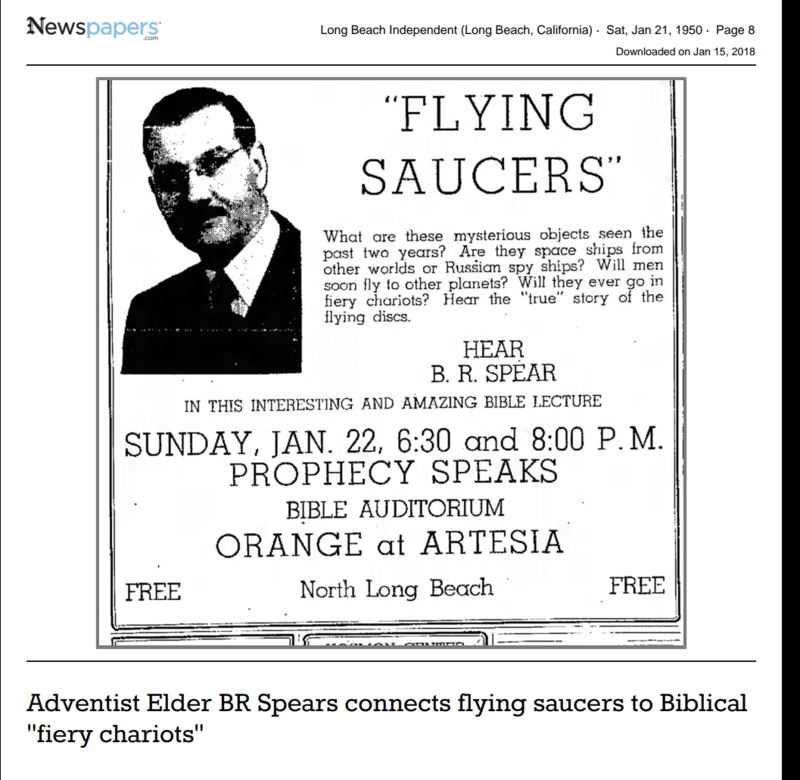 Spear connected flying saucers to Biblical fiery chariots in an ad for his 1950 Bible Prophecy lectures. 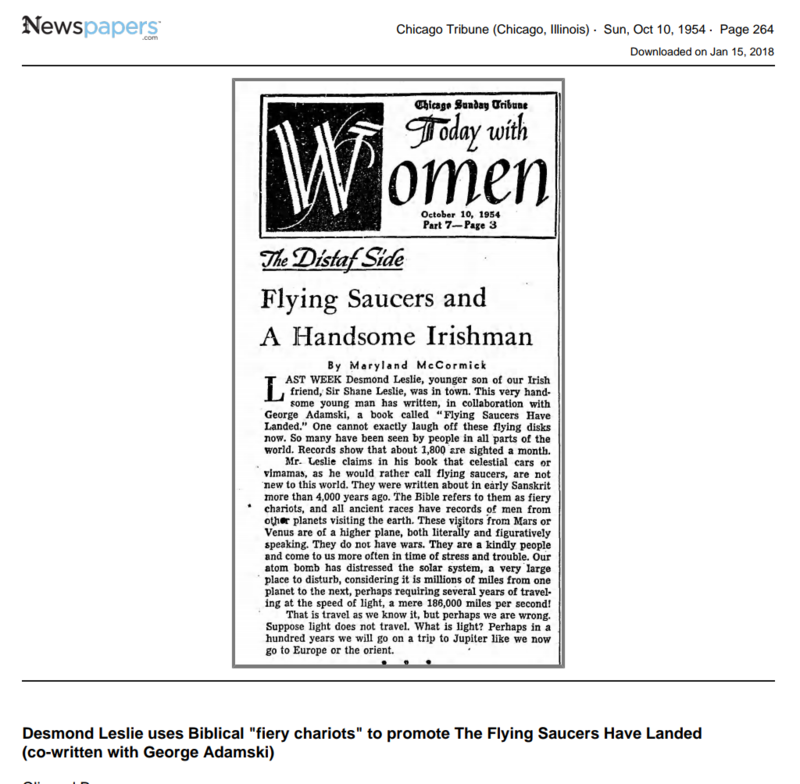 Furthermore, George Adamski and Desmond Leslie used the idea that the Bible’s fiery chariots were today’s flying saucers to promote their 1953 book, The Flying Saucers Have Landed. “Yes, in several ways. You see, one time the sons of God (demons or fallen angels) came down unto the daughters of men. The children that were born unto such a union were men of renown, or giants. For this reason God sent a flood and destroyed the Earth and the people. Had He not done so the devil could have taken over with his supernatural power. destroyed man from the earth. (Gen. 6). Could that take place again? Will not the antichrist be a god-man? Will he not be the son of perdition (II Thes. 2:3)? Yes he will have the Supernatural power of the devil. He will demand worship. He will work miracles and cause fire to come down from heaven. He will try to imitate the works of God (Rev. 13). Since the Lord sent down chariots of fire in the days of Elijah and in the days of Elisha (II King 2:11) Satan can also send chariots of fire. The spaceships that appeared over most of the nations last night were described by those who saw them as “a blazing brilliant object on fire like a neon sign”. Satan will actually make the claims that he is God. 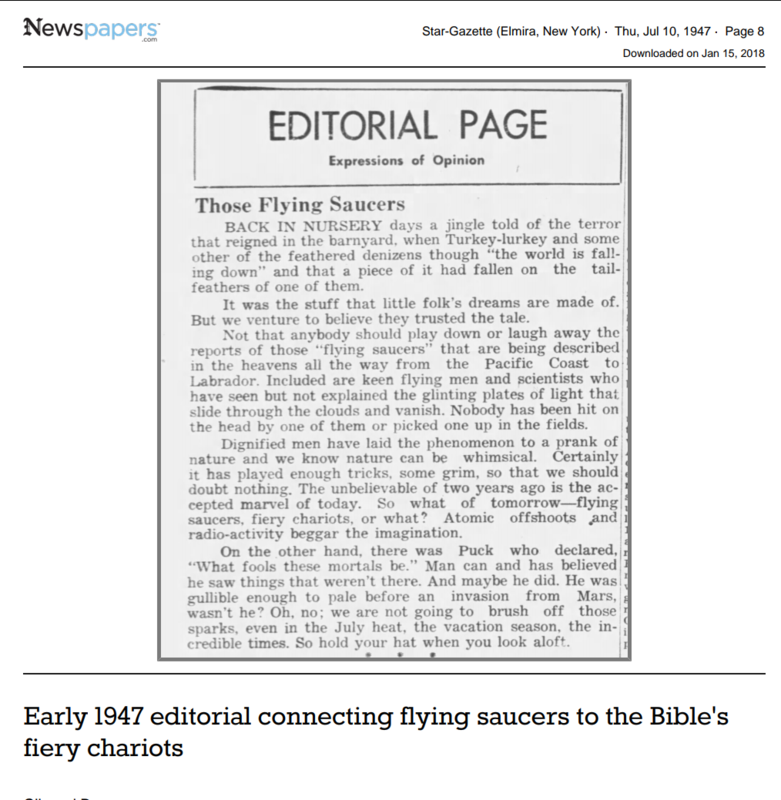 I do find it odd that he supposes that these fiery chariots or flying saucers are an example of Satan mimicking the power of God, yet he does not seem to ever entertain the idea that some of these flying saucers could be presently of God. It’s like he admits that God used such methods in the past, but he leaves one with the implication that holy fiery chariots were discontinued in practice. Personally, I have always said that the biggest weakness of the Demonic hypothesis of UFO is that it leaves God’s angels with very little to do. 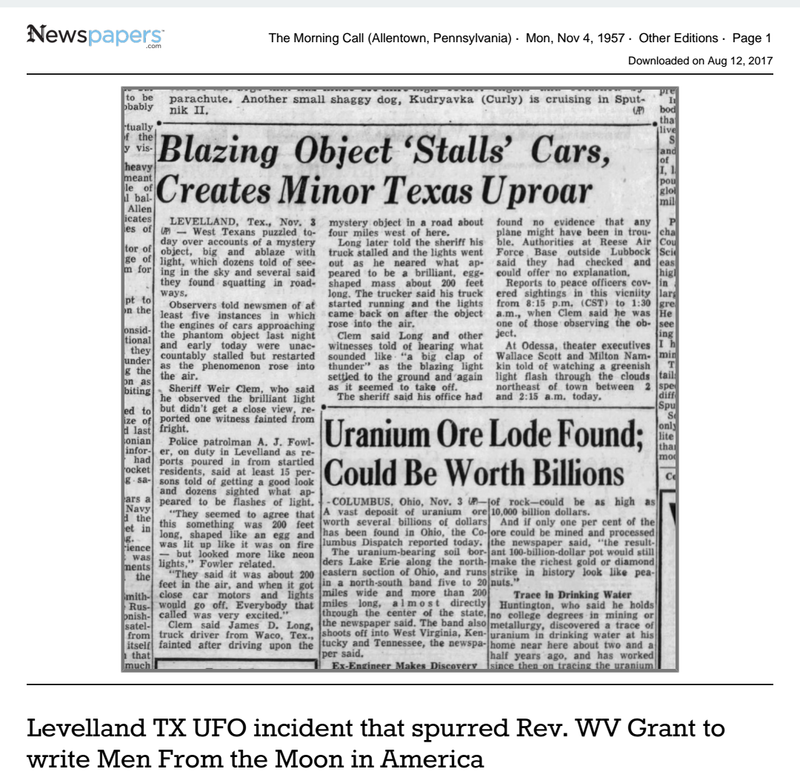 What’s unique about this particular book is that WV Grant makes a case for the devil living on the moon, and not just as a possibility, but a certain fact! 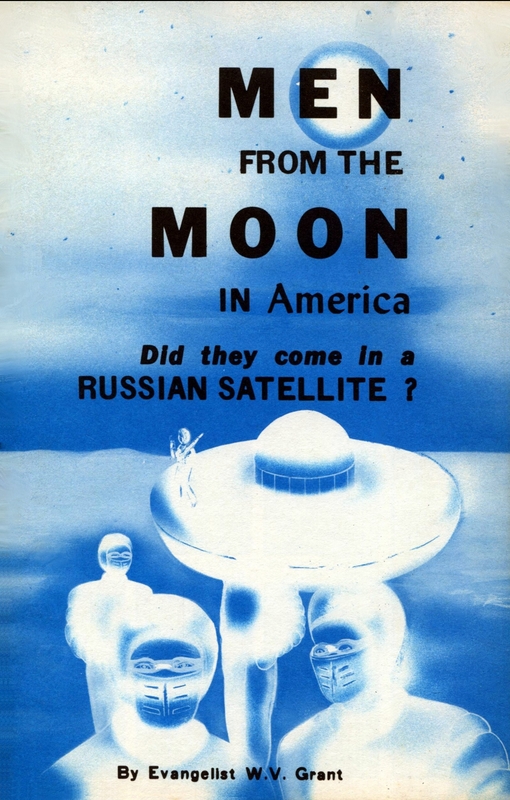 Don’t You Think There Are Inhabitants On the Moon? on down from one generation to another unto the birth of Christ, and up to the present time. That settles it. The first man was Adam. So the men that dwell around the moon must be disembodied spirits. They must be demon spirits. The voices which the spiritists hear must be demon voices. Of course, the demons may appear in many different forms. natural men, which were in the generations from Adam until now. Adam was the first man (I Cor. 15:45). is traced right back to the time of Adam. Which was the son of Enos, which was the son of Seth, which was the son of Adam, which was the son of God (Read Luke 3:23-38). It is because they believe in evolution. That is what they teach in their books. First, God told me by revelation, that these men, who see supernatural people, have received seducing spirits and doctrines of devils. Then after I spent sometime searching their books I found that they believe and practice witchcraft, that they teach evolution. To try to establish their theory they teach that there are people on the moon and other planets who have become perfect by their own righteousness. They teach that we just happened to be here, that we are growing better and better until we save ourselves by our good works. But the Bible teaches that man fell and needs a Saviour. 16. Is It Really Possible That Evil Spirits, or Demons, Are Near the Moon? It certainly is. It is not only possible, but it is exactly that way. Most all people who have had experience with devil possessed people will tell you that the devils are at their worst when the moon is full. The Bible plainly declares that the devil is the god of this world (II Cor. 2:2). He is the prince and power of the air (Eph. 2:2). But he will soon be cast out of the heavens, having great wrath, for he knows that he will have only a short time to work (Rev. 12). A natural man can’t live on the moon, but spiritist men (demons) can exist in the air, until God says that it is enough and casts them down. Grant ended up being a false prophet. My grandfather often recalled that many preachers back in those times thought it was folly to try to put a man on the moon because God had stopped man from trying to reach the heavens at Babel. This, of course, was a misunderstanding of context of that Passage. God stopped the building of the Tower of Babel by confusing the languages because He had told mankind to disperse and populate the Earth and instead they had chosen to gather together in one place. It was never about the fact they were trying to reach heaven. We reached the moon after all… where the Devil doesn’t live. Previous Post Is a Rare Earth a Powerful Test of the Creation/Evolution Models of Origins?